Here’s something you don’t see every day: an online video slot with 5 rows, 5 reels, 100 pay-lines, but only two coin betting options. 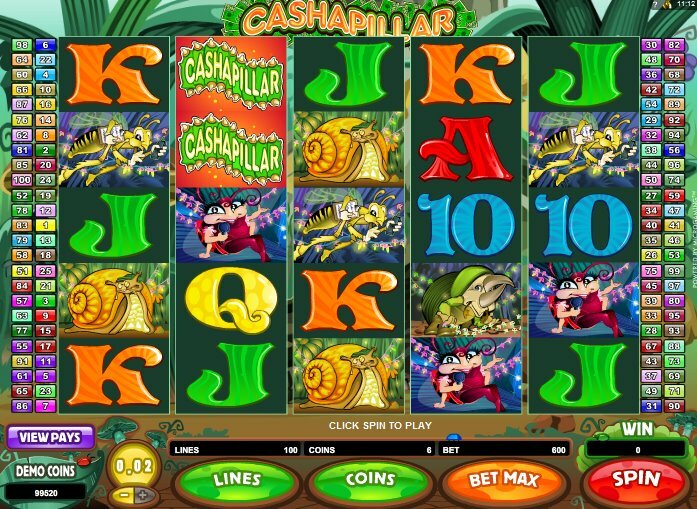 Although those coins are $0.01 and $0.02 there’s still a bewildering scope for different bet sizes in Microgaming’s insect-themed slot, Cashapillar, and with the game carrying a maximum jackpot of 600,000 coins it still could provide a very generous payday indeed. A jolly ragtime jazz soundtrack accompanies a set of reels that contains all kinds of creepy crawlies gathering together for the caterpillar’s birthday: snails, beetles, ladybirds, the caterpillar itself and his cake. The customary poker symbols, 10-through-ace, are also represented. The Cashapillar logo is Wild, and substitutes for all symbols other than the Scatter. It also appears Stacked, and with 5 rows and the 100 pay-line system, it can really add up to some juicy wins. Having said that, with the 100 pay-lines I still found meaningful winning combos a little hard to come by. Perhaps the high variance attached to this slot is justified. The Scattered Birthday Cake triggers free spins if you hit three across the reels. 15 free spins can be yours, and with a 3x multiplier attached they’re definitely worth hitting. Free spins don’t come around much but I found this paying out quite nicely, and managed to accumulate a 24,000-coin jackpot during each of the two free spins rounds I managed to hit. OK, it’s a little far away from the 6 million-coin jackpot you can win during free spins, but even at betting $0.02 it means some nice, regular wins. 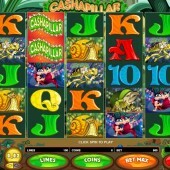 With massive potential for betting, plus some juicy Stacked Wilds and free spins, Cashapillar is certainly one for the action junkies. It might not carry the 3D loveliness of Sheriff Gaming’s nature-themed slots, One Million Ants and its other insect-fest slot Bugs, but the cute graphics, fun music and, yes, free spins, should ensure a good time.